Here is a little gem I would like to talk about called Cocina Condesa in Studio City on Ventura Blvd where Sunday brunch is fueled by the rather strong cocktail creations of David Rubin, a transplanted New Yorker. Chef here is Eddy Garcia, and together they make quite a team with Garcia acting and certainly looking like a genuine Aztec dancer, which I think was his former career, and Rubin a high energy character eager to impress locals in his first year from New York. Garcia has worked with a lot of well known chefs including Mary Sue Milliken and Susan Feniger and this is his chance to shine following his stints at Sweeney’s Ale House and The Woodman. The design is very colorful and attractive with lots of yellow, blue and Red everywhere, and a front that opens up onto the street and an outside patio for dining. Brunch here is slow and casual and easy to linger around to enjoy the drinks and the food. Brunch cocktail are served from 9am-3pm and are priced at $10 and if you plan to have a few then Uber has to be the way to go. I would almost certainly start with the “Abajo de la Playa” which consists of Monkey Coconut Rum, prohibido rum, coconut and pineapple. However Rubin is big into Mezcal, so ask him for “The Maestro,’’ another potent blend of El Silencio Mezcal with lemon, ginger and fresno chiles and I believe a blend of cricket sauce to spice it up. Gin lovers can try “La Mariposa” with a mixture of gin (unnamed), St.Germaine’s elderflower, lime juice, cucumber and squirt. Food wise the brunch menu is comprehensive enough with the preferred starter of choice being Buttermilk Pancakes w/Mayan Chocolate Crumble ($10). This menu favorite comes with seared plantains and piloncillo syrup. There are also interesting items such as Strawberry & Mango Mexican French Toast ($11) with Bolillo and syrup, and plenty of creations with eggs such as the Desayamo Burrito, Huevos Rancheros and Mix Peppers and Egg White Omelet. The good thing is that none of these brunch specials are priced more than $13. For those of you who would rather stay a bit more traditional, then there is an extensive Taco Plate selection all priced at $11. Including skirt steak, pork, pork shoulder, mahi mahi and grilled chicken. I tried the Grilled Shrimp which was perfect, and next visit I will try it paleo style, which means served in boston lettuce leaves. 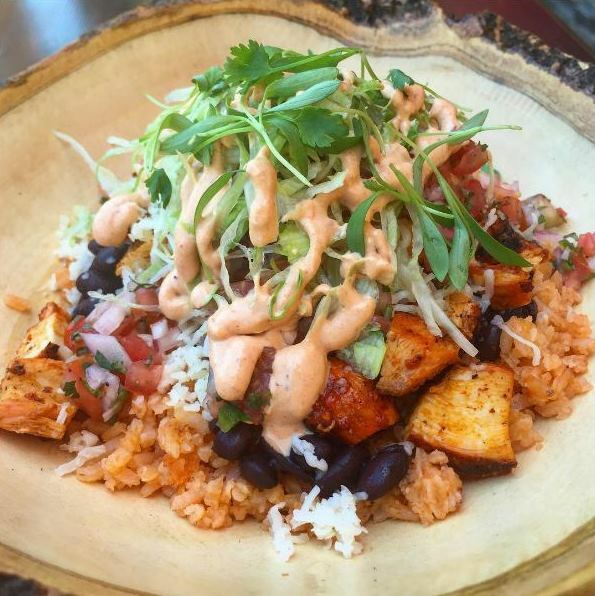 There are four types of Ensaladas, Kale, Shrimp, Chicken and Salmon, along with Burritos and three bowls (Spicy Carnitas, Al Pastor, and Grilled Shrimp), served over Quinoa and Mexican Rice. This is a really cool place that I hope sticks around for a long time.